KARACHI: Pakistan People’s Party (PPP) leader Murad Ali Shah on Saturday took oath as the 29th chief minister of Sindh at the Governor House while hosting a lavish dinner for the guests and media persons. 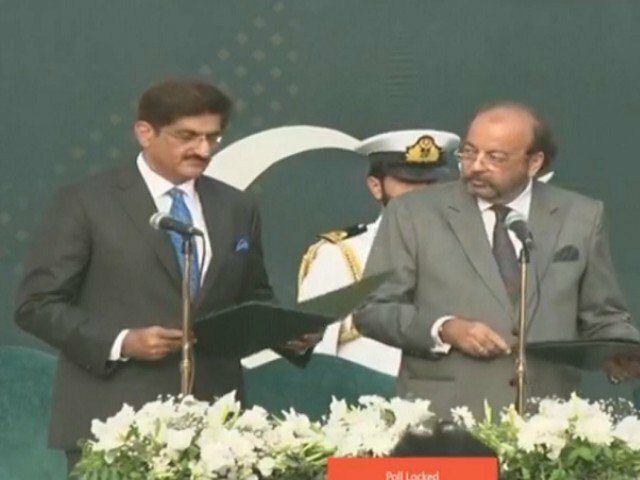 Sindh Acting Governor Agha Siraj Khan Durrani administered the oath to the newly-elected chief minister who would serve as the provincial chief executive for the second tenure. After sworn into the office, Murad Ali Shah is the 29th CM of Sindh since creation of Pakistan and the 33rd CM since 193the 6 when Sindh was given the status of a separate province during British Colonial rule. Shah was elected as the new CM on Thursday after securing 97 out of 158 votes polled in the Sindh Assembly for the election of Leader of the House. Murad Ali Shah defeated Shaharyar Khan Mahar, who was the joint candidate of the Grand Democratic Alliance, the Muttahida Quami Movement-Pakistan (MQM-P) and the Pakistan Tehreek-e-Insaf (PTI). Earlier, the incumbent has served as the finance and irrigation minister and then as the CM in a stint from July 29, 2016 to May 28 this year. He will be heading the third consecutive government of the PPP in Sindh. Shah was elected MPA from PS-80 from his native Sehwan Sharif in the general elections held on July 25. Before the general elections of 2013, he had to resign as an MPA on the issue of dual citizenship of Canada, which he later formally renounced. A number of parliamentarians, lawmakers, senior government officials, members of Sindh caretaker government and other dignitaries attended the oath taking ceremony. According to sources, after taking his oath, the new chief minister drove away to a private hospital to inquire about the health of Zardari’s close aid Anwar Majeed who has been arrested for money laundering.